Fire crews have saved a home from being destroyed after a shed blaze spread to the main property. West Sussex Fire and Rescue Service were called to a report of the shed fire in Trent Road, Worthing, at around 7.30pm on Friday evening. Three pumps were in attendance, a spokesman said. When they arrived, a shed was on fire, as was the ground floor of a property. 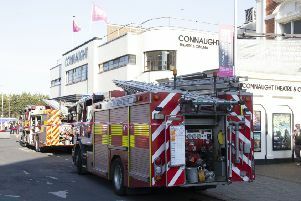 The shed was 100 per cent destroyed, while a ground floor kitchen was 50 per cent damaged, and there was smoke damage to the rest of the property. Crews damped down the scene and left at 9.20pm, a fire service spokesman said. This comes after a car was completely destroyed by a fire an hour before in another part of Worthing.